*Note: I haven’t been updating the information here as I go along anymore (as of Spring 2017). This information is still correct to the best of my knowledge, but I keep adding little bits to the Glossary on Adventures in Pin Loom Weaving. 1-2 side of loom — “1-2 side” is an example of the way I refer to the sides of the loom. 1-2 is the side extending from Cr1 to Cr2, or the bottom of the loom. 3-4 side (or edge) extends from Cr3 to Cr4. 1-3 extends from Cr1 to Cr3 and is the left side of the loom. 2-4 is the right side of the loom, extending from Cr2 to Cr4. 2LW —Two-Layer Warping, but it can also refer to two-layer weaving. 3LW — Three-Layer Warping, but it can also refer to three-layer weaving. Cr — corner, e.g. Cr1 means corner 1, the lower left corner of the loom. P — Plain weave: taking the needle over, then under (or under, then over) one stitch at a time. Some people use W to indicate plain weave, but I don’t like it as it gets confusing with W also referring to warp and weft. WfL1, WfL2 — Weft-Layer-1, Weft-Layer-2. These abbreviations appear in the “Houndstooth Check” pattern and are used to clarify steps in the process of weaving half of the weft with one color, then returning to the beginning and weaving the other half with another color. ENDS — This is a weaving term that refers to the number of warp threads, i.e. on a Weave-it 4-inch square there are 31 warp ends. I rarely use this term, instead referring to warp and weft threads as strands. To me “ends” means the strands have been cut as they would be when warped on a conventional loom. EVEN AND ODD — Frequently when I give instructions, I’ll refer to the edge of the loom by its two numbered corners: bottom edge is the 1-2 edge, top is 3-4; left side is 1-3 (sometimes also called the “even side” if you have a loom with numbered rows); right side is 2-4 (also called the “odd side” if your loom has numbered rows). FELL LINE — the horizontal weaving line. You want to keep it straight across, not wavy, not angled. Try to pack your weaving evenly in each row. Use the tug technique. The needle shows the correct appearance of a straight fell line. Notice how each row below it is horizontal and evenly packed with the stitches all around it. You want to avoid uneven gaps between the threads. FLOATS — A float is a thread that should have been woven over (or under) as in plain weave. Instead it’s left to “float” above the weaving as part of a pattern. In the pink ribbon all the vertical pink strands that make up the ribbon picture are warp floats; on the back, the white floats are weft floats. HALFTONE — Particularly noticeable in plaid weaving, a halftone occurs in opposition to a solid colored space. Solid sections have all the warp and weft strands the same color. In halftone, the warp and weft strands are half of one color, half another. The Nine-Patch Plaid square is an example. HYPOTENUSE — The long side of a triangle. 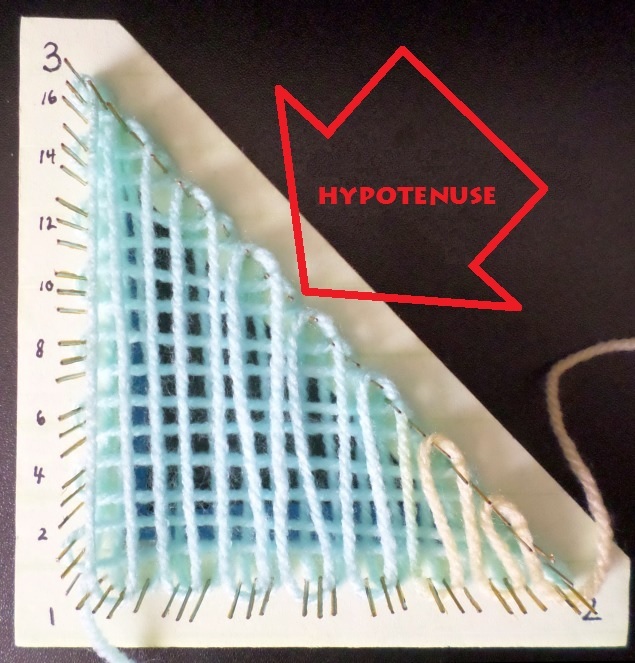 Pieces woven on the right angle loom will have a stretchy (bias) edge along the hypotenuse. You can alleviate the stretch by working the yarn tail in along that edge. 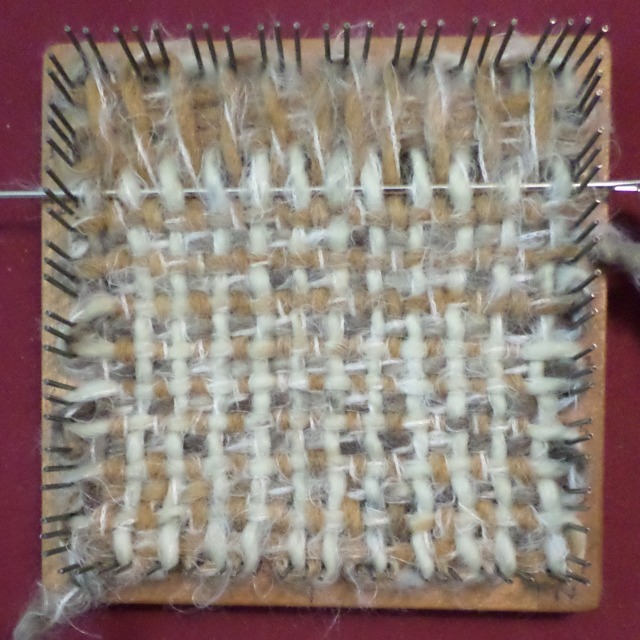 LAYERS — There are 3 “warping” layers in 3LW (though technically L2 is a weft layer); the fourth layer is woven with the needle. E.g., L1 refers to the first layer of warping on the pin loom. 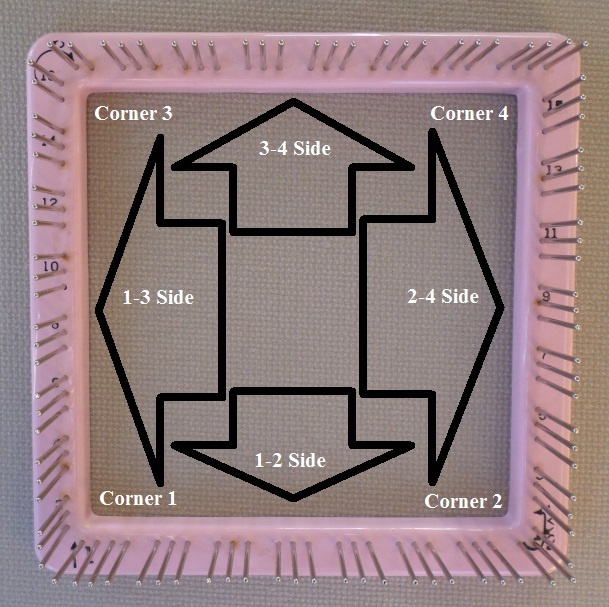 In 2LW there are two warping layers, one weaving layer. TUG TECHNIQUE — Demonstrated in this video, and repeated in all my videos, the tug technique is used to pack weft rows as you weave so you don’t run out of room at the top of the square. It keeps rows looking uniform throughout the weaving instead of having the last few rows crammed together at the top. The Side Tug Technique means to give an extra pull to the thread after you’ve woven the row. I use it more in 2LW, but it’s also useful in 3LW. WARP — The vertical strands on the loom. The warp strands must be in place before you can weave. Sometimes we refer to preparing L1-3 as warping the loom. This is a term of convenience because, in 3LW, L2 is a weft layer. WEFT — The horizontal, or woven, strands in the fabric, taken through the warp. Sometimes called woof or filling. YARN WEIGHTS — You can TRY any yarn on the pin loom, but I don’t recommend super fine or super chunky yarn. Super fine can be doubled or tripled or combined with another lightweight yarn. If you use yarn that’s too heavy you may damage your loom. See Bulky Yarn Revisited.